Both the Mayor and the Governor have spoken. 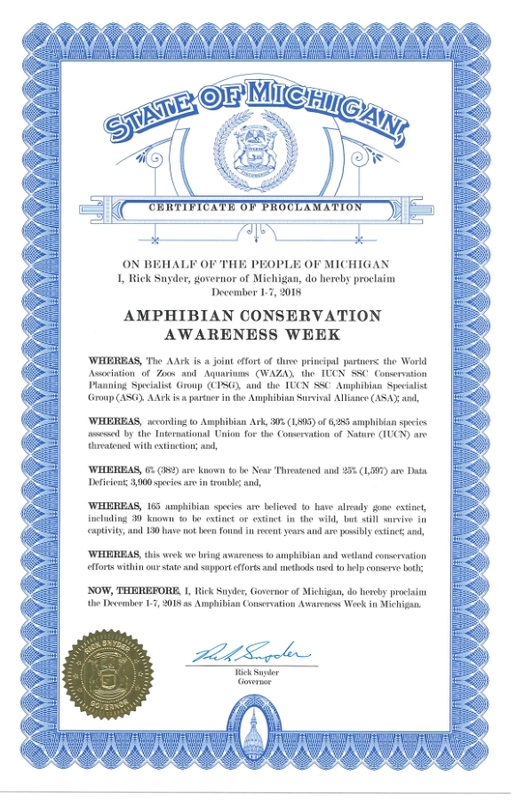 Throughout Michigan, December 1 through 7 is now officially known as Amphibian Conservation Awareness Week. Michigan Gov. Richard Snyder made the official declaration after being approached by sixth-grader Trinity Favazza. Favazza has been selected as the Mayor of Amphibiville for the Detroit Zoological Society for two straight terms. During the conservation week, Favazza will be promoting awareness with her Switzer Elementary classmates by bringing in frog-themed items each of the five school days, such as frog treats/pencils/squishy toys/and bookmarks. She also created frog awareness cards that highlight a new frog each day with fun facts and pictures and an awareness brochure for her classmates to take home and help spread the word. Below is the resolution adopted by Governor Snyder.